We have been experiencing some hot days in Ontario and across Canada. Everything seems to be in the making for an extreme summer – before it was the rain and now it’s the sun. Our hearts go out to everyone who has experienced the wild fires & air quality issues. We are now really hoping for some rain. Taking care of those fields and getting the most of summers abundance isn’t easy without it. Still, the farmers have been arriving to the market with an impressive abundance and variety. The zucchini’s seem to be growing in one size only – XL. Cauliflower & potatoes have made for the perfect veggie roast mixtures. The herbs & FloraLora flowers have kept everything so fresh smelling. And who can forget Madeleines doggie treats have added something yummy for our four-legged friends. 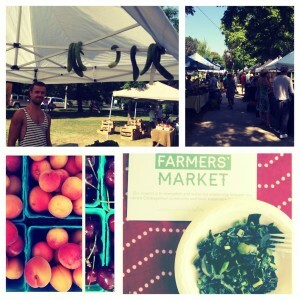 Keep August 18th open as we will be doing some extra fun things at the market that day! Enjoy the family friendly tunes by Bradley James McGoey. Peaches & Corn! Organically grown peaches, freshly picked are ripe & juicy. They can be enjoyed just like an apple, cut up in oats or -my favourite- cut in half, basted with a little honey, grilled & served over ice-cream or mascarpone. GMO-free corn is hard to find anywhere but a local market. Like all GMOs, genetically modified sweet corn has not been thoroughly tested to ensure that it is safe for consumption. At the market we want to ensure safe & healthy food for us to eat! The latest sweet corn recipe I tried is La Carnita’s queso topping — absolutely mouth watering. GreenLane Estate Winery has a wonderful rosé for your summer parties. We want to welcome a new vendor: The Bee Shop. Principle beekeeper Oliver Couto will be selling bee products like honey, pollen & soaps as well as bee education. This week enjoy continuing on with summer traditions & try your hand at any on of these four delicious marinades. Summertime is grilling time. And what teams better with grilled foods than crisp salads and grilled vegetables? These four simple dressings perform double-duty as both vinaigrettes for salads and cooked vegetables and marinades for meats, poultry, fish, tofu, tempeh, and any other foods that take well to marinating. • Most marinades contain some sort of acid such as vinegar, citrus, wine and/or yogurt. Use nonreactive containers—glass, stainless steel or ceramic—and avoid the use of aluminum containers and zip-top plastic bags (aluminum or plasticizer chemicals will leach into your food). • To avoid mushy fish, make sure never to marinate fish or seafood longer than 30 minutes. Meats and poultry should be marinated for at least 2 hours or up to 24 hours. • Immediately discard any marinades that have been used with meats, poultry or fish. Do not reuse them or serve them. I sometimes make this more assertive by upping the quantity of Worcestershire and hot sauce and adding freshly grated horseradish (or bottled horseradish in a pinch). Bloody Mary salad, anyone? Makes about 2/3 cup. This recipe is great as a salad dressing but I love using it for marinating thin cuts of short ribs (often called Miami ribs or kalbi ribs) or pounded boneless chicken thighs prior to grilling. Add about 1/4 cup of crunchy or creamy peanut butter to the recipe for a delicious peanut sauce that’s great tossed with noodles or steamed vegetables or used as a dipping sauce for grilled kebobs. Makes about 1 cup. This mix of ingredients provides a bright burst of flavour when drizzled over delicate greens like spinach and leaf lettuce. It’s also ideal for marinating fish, seafood, and poultry. Makes about 2/3 cup. In a small bowl, whisk together the mustard, vinegar, salt and pepper. 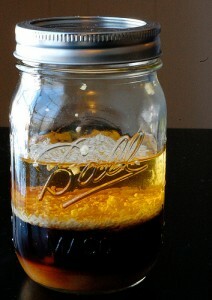 Slowly whisk in the oil until emulsified. Whisk in the juice, honey, chives (if using) and thyme. Equally fabulous when tossed with fresh or steamed vegetables or as a marinade for chicken, fish, or seafood. Marinate bone-in or boneless chicken for a minimum of three hours or up to a full day. The live cultures and lactic acid in the yogurt apparently act as a tenderizer for poultry, producing juicy, succulent chicken. Makes about 1 1/4 cups. Heat a small frying pan over medium heat. Add the coriander and cumin and cook, stirring continuously, for 30 seconds. Transfer the toasted spices to a medium bowl. Whisk in the yogurt, lemon juice, garlic, ginger, jalapeño, salt, turmeric and cayenne.